So, this continues to be a fun little series of blogs. Like I said, I find these SuperSlow experiments interesting and motivating, especially in a time where I now believe muscular growth can happen much faster than I even thought before. I will continue to post people’s experiences from the past and in the end provide what I think is the best way to integrate a system of training that includes some from the past with what we’ve learned since. Effective overload best occurs when the positive or lifting phase of each repetition is performed in 10 seconds. The negative or lowering phase is done in 5 seconds. – Work between 4 and 8 repetitions. When 8 or more repetitions are done in good form, add 5 percent more resistance at the next workout. – Perform each repetition in the SuperSlow style. Lift the weight slowly in 10 seconds. Lower the weight smoothly in 5 seconds. – Keep your workouts brief. In other words, each repetition should take at least 15 seconds. Such style of training is called SuperSlow. SuperSlow training is the most efficient way to stimulate your muscles to grow larger and stronger. It’s the best way to get bigger. Why is SuperSlow training better than faster styles of lifting? Because it eliminates most of the momentum from each repetition. Eliminating the momentum better isolates the involved muscles and makes the exercise harder. Remember, the harder and the more targeted the exercise is, the better. Pretend that you are preforming leg extension. You complete four repetitions and begin a fifth. You sense that your speed is bogging down. You remain determined to maintain uniform speed. However, the speed grows slower as you become weaker. Realize that as your musculature becomes weaker, it becomes feeble. Often is can still lift the movement arm, but only very slowly. Such slow movement and muscle feebleness dull sense of position and movement. Even though you are moving, you do not perceive it. You must actively sense or feel to detect movement. Deliberately refuse to accept the idea that you are no longer moving Believe in it. Have the mind-set that even though the muscle is incapable, I’m going to complete the movement anyway! In many cases, upward movement will continue and you’ll complete the repetition. Give it time. Whittle on it. The repetition may require 30 seconds to finish. Once the repetition completes, smoothly lower in and try another. Never, never give up if additional positive movement is possible. And then stop only after you’ve spent another 10 to 15 seconds trying for an extra fraction of an inch. These helpful hints above were paraphrased from Ken Hutchins’ revised book, SuperSlow: The Ultimate Exercise Protocol, which I highly recommend. Ken has supervised over 10,000 SuperSlow workouts, and no one understands the philosophy and techniques better than he does. Dr. Bill Gonyea has lifted weights for 30 years. He also is professor and chairman of the department of anatomy at the University of Texas Southwestern Medical Center at Dallas. For many years he has worked with medical students who are interested in exercise and muscle enlargement. Recently, Dr. Gonyea reported the results of a six-year study with cats. The study was published in the Journal of Applied Sport Science Research (3:85-92, 1989). The findings will interest you. Sixty-two cats were operantly conditioned, using a food reward, to lift weights with their right forelimb by performing a wrist flexion exercise. The cats reached through a tunnel in one side of the clear plastic enclosure and grasped a bar, which was attached to weights via a cable and pulley system. The cats then flexed their wrists against the bar, which lifted the weights. The cats trained once a day, five days per week. 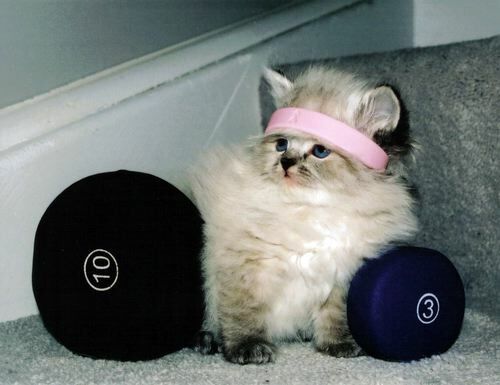 All the cats began training lifting 100 grams. The weight was increased as the cats progressed. When a cat failed to make progress after a predetermined period, the muscles of the right and left forelimbs were removed and weighed. The cats were not forced to perform by punishment. Thus, the intensity and speed of training was dependent upon each cat’s personality and motivation for food. This in turn resulted in a broad range of performance values and muscle mass increases, which was accounted for with appropriate statistical analyses. – The cats that eventually trained with the heaviest weights developed larger muscle masses in their exercised forelimbs compared to those that employed lighter weights. – The cats that used slower lifting speeds developed larger muscles than those using faster lifting speeds. – In the final analysis, the slower and heavier the lifting, the greater was the muscle mass increase. Dr. Gonyea is convinced that bodybuilders can learn something from his study with cats. Bodybuilders should understand that lifting heavy weights slowly is the best way to increase the muscular size of a cat. And it is also the best way, he believes, to increase the muscular size of a human. Of course you should already know this by now, right? 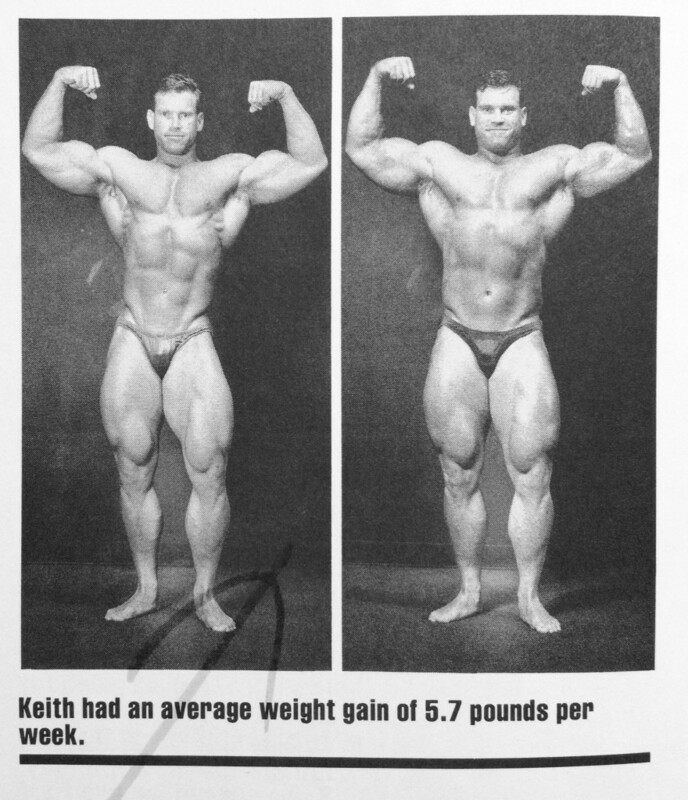 Keith Whitley finished the program weighing 280.3 pounds, which was up 34.3 pounds from his starting body weight of 246. His average weight gain was 5.7 pounds a week. he doesn’t look like hes built much muscle tbf. looks like bodyfat. Yes he looks smoother but he does appear that he gained muscle too! Ellington has been a good influence on the world stage he’s the one that initially told me about Dr. Ben Bochicco or however you spell his name. And of course Ken put into precise terms and laid it all out and further techniques and refinements by the Renex team. Josh, Jeff and Al. 2% body fat!?! Not really very credible. Isn’t it pretty common, when trying to bulk up rapidly, to add 1 to 3 lbs of fat per pound of muscle? At least that was the impression I got from reading about people who have tried Starting Strength with Gomad. Your lifts go up impressively (at least for young males), so does your body fat. Regarding the cat experiments: Isn’t heavy weight and slow lifting velocity kind of a “duh”. Just look at a force velocity curve – slow velocities enable a lifter to develop maximum force. My understanding is that the best power lifters have learned to grind through their lifts – big weights rarely go up at a high velocity. Did the best-gaining cats actually attempt to control the speed of their contractions on the exercise? When you lift a heavy weight that is really challenging you can’t move it fast anyway, so more likely some of the motivated cats were working close to the 1 RM. The cat study did not mention genetic variation. I have two cats that are the same breed, but one is clearly an endomorph and the other an ectomorph. Which one do you think can put on more mass? Which one is more motivated by food? Which one is stronger? The results of the cat study don’t prove causality, just a relationship. This dude Keith Whitley was already huge. Was he on gear? I don’t ever see anyone that big who isn’t. It does look like a good part of his gains were fat. For example his waist grew by more than 3″. To eliminate almost all momentum and ballistics you don’t need a 10-5 rep cadence. You can do it 4-4 as long as you concentrate on the turn-arounds. I can send an excel model that has force-velocity calculations built in all based on earths gravity. You plug in the distance and time and can see that the force to move in the concentric is always a bit more than the resistance and the eccentric force is always less than the resistance. However when you try to lift the weight fast it requires a lot more force. If super-slow reduces the resistance that the trainee can use, is that not by definition “lower-intensity”. Which creates more tension, a lighter weight or a heavier weight? Why not use a heavier weight, fewer reps and something like a 4-4 rep cadence and do it rest-pause style to get enough volume? You can try to apply your “formula” but we are not machines and it takes way longer to engage the proper synergy than you are aware….neurological aspect…. Take a machine with a good resistance curve, low friction and squeeze off the lower turn….on your final reps you are pushing as hard and as fast as you can and often you won’t be 1/8th of the way out of the lower turn in 4 seconds….but you wouldn’t know that if you didn’t have the proper gear or technique. Thanks for posting this Joshua. It is an interesting notion, that slow turn arounds are neurologically different, some how engage more muscle (and allow more force?). But you are also steering the discussion in a different direction. Ed was specifically talking about momentum effects. Is your position still that such slow cadences are necessary to avoid dangerous force from momentum effects? Many people who have measured or modeled such movements long ago concluded that concerns about force variations from acceleration were overblown. As far as I can tell, Newtons laws of motion pretty good for this kind of question. Yes i’m steering this another direction….it’s all a moot point if your behaviors are as we instruct on the equipment that we use— 4 seconds is a impossibility…..maybe… possibly you could scrape in at 6 or 7 seconds early in a set. toward the end of a set you may see 4 seconds pass by the time you are an 1/8 or a quarter just past the lower turn. this has far less to do with 10 seconds or 4 seconds but rather the result that will occur due to the required behavior, fatigue, inroad, and maintenance of meaningful tension on the intended musculature. much of the confusion comes with people trying to compare what we do to the orthodox strength training paradigm….may be easier to just view them as two completely different things. Might be a moot point with respect to what you teach now. But like it or not, RenEx comes with all the history & legacy of Super Slow. And for a long time, one of the stated reasons for strict adherence to the Super Slow 10/10 protocol was safety – to reduce momentum effects. I am simply asking if you guys have changed your opinion on that? Not sure why you are reluctant to answer the question. I’m not exactly sure of the question…we do what we do to increase intensity and reduce force. At maximum moment arm we use MORE resistance than you would with conventional exercise as well as keeping you more effectively loaded. Thanks for posting this too. Was it ever true? Because if I look at older articles about SuperSlow, it is sometimes said that loads need to be reduced to be able to sustain the long times under tension that some people used. The reduced loads were part of the reason it was supposed to be safer. A must in the case when equipment is high friction, has poor biomechanics or especially in the case of these backwards resistance curves. Of course a new subject MUST scale back to learn proper synergy pattern( which it appears almost no one recognizes), to learn how to maintain tension, to gain tolerance and pain threshold, to find their “low gear”….to master techniques. But go back and reads Ken’s SuperSlow manual… he discusses a experiment where Jim Flanagan is the the subject….do you remember where his poundages ended up??? and this was using the worst cam for the method. The reason the protocol is safer is because the forces are significantly less and they are not allowed to jump on and off the muscle. You use more resistance and end up with less force on the muscle? How is that possible? Thanks for bringing all this stuff up Ed. you can have far less resistance and higher forces or you could have higher resistance and much less force. I’d recommend you read the technical manual before wasting more energy this way. Unfortunately, after showing the equation, the discussion of momentum effects is largely, if not entirely, qualitative. Time to dust off my old copy of MathCad and run some scenarios…. jackie: always happy to help :0magic mixer shd do the job, but make sure u don’t ovrleoad the machine. can it take half the recipe? tell me how it turned out! Hope even for experimental purposes that no one has their limbs removed for weighing. Also Keiths juiced to the gills. All these pictures and success stories mean nothing, Josh means nothing, I will put an end to RenEx. Joe H, something i agree with. Whats required is positive examples using genetically normal, clean individuals. I personally employed SuperSlow and trained numerous clientele on MedX equipment for almost 5 years. However, I believe that the majority of muscle fiber affected is sacoplastic and not myofibrillar-i.e., surface tissue versus deep tissue. Case in point, when I reverted to Kettlebell, Barbell, and Bodyweight movements at “normal” cadences (1-2: 3-4 seconds), myself and my clients were significantly weaker. Also, we observed an inability to fire auxiliary groups to assist in multiple joint movements like Dead Lifts, Squats, and Military Presses. Super Slow is a safe way to lift weights, but there is absolutely NO carryover for sport specific athletes and basically normal activities requiring strength. i can’t figure out how one believes being more strict with exercise performance makes one weaker??????? the sport we all play is life. If SS does not carryover to Sport will it then not carry over to life. Surely Mike W’s actual observation is enough for you to figure out why he stated what he stated, AND he did not say weaker, he said carry over. I.E- whilst one got better at SS it did not help with anything else, and whilst we all understand specifity, basic lifting to a degree does carry over to life and sports. if you want to be “good” at those lifts understand that there is skill involved and you would have to continue to practice them. I have had tremendous sucess putting together programs for power lifters. It’s kind of a no brainer that if you stop practicing barbell lifts that you will cease to be as efficient with that movement pattern….no ? But strength and muscle mass adaptations from resistance training are valued precisely because these lead to improved performance in other activities, ones that were not specifically trained. Why else would athletes bother to invest in general strength training? I am reminded of a controversial article that Dan John wrote many years ago about his 2 years of training on Nautilus equipment. He got the best advice available, did it enthusiastically for 2 years. But gave it up when the length of his discus throws began to fall off. When he went back to barbell work and Olympic style lifting, his discus throws got longer again. Now clearly, resistance training on nautilus machines is different than throwing a discus. But dead lifts, squats, cleans, and snatches are also different than throwing a discus. Dan John found that training with barbells did more for his throwing than training on Nautilus machines. Perhaps situations like this are why HIT methods haven’t become more popular among competitive athletes. Your mistake is the belief that you are measuring strength somehow. all of those exercises require more skill proficiency…..if you want to lift these objects you need to keep up with that skill. I’ve beat this to death, i can pretty pretty much squat or dead what i want, i really don’t see a point….better, safer ways to build strength. look we all want safety and longevity from strenght exercise, but if that safety and longevity comes with little measurable results or performance then one will doubt it gives anything. Josh you have trained many ways before SS, building your strenght base, and now use state of the art equipmemt designed specifically for SS, which nearly most of the rest of the training World have no access too. So using yourself as proof does not stand up. You need normal clean average subjects to test out on your equipment and free-weights to give validity to this protocol. again if you can deadlift say 400 pounds in good form, this will help you moving heavy things outside the gym. What Mike W and others for that matter are saying is that SS does not at all. You are asking me why he’s saying that or you are asking me why he is unhappy with his results?…i’m not sure his agenda….Neither of those questions I can answer. I’m more curious how he is measuring strength. I only train RenEx and I’ve never met a stronger person pound for pound. So he says one thing and I say other, I can’t tell you why other people think as they do. I only know what I know. I have been mostly training 8/12-8/12 rep speed, using 100% bodyweight only exercise for almost the entire last year, and I hit my decade ago BRAWN era training numbers when I tested myself on free weights last week. Pushups, Handstand Pushups, Squats, Single Leg Squats, Sternum Pull ups & L sit dips on gymnastic rings etc done SS twice per week mostly. Never been stronger or more “functional”, whatever that is. Developed a ‘”low gear” like JT said. Even when I used stuff like Hammer Strength, within a few months I was able to blow by my 2/4 -3/3 loads. You guys are doing it wrong. can you clarify that Patrick. Seems a contradiction there. Firstly you say when you tested yourself on free weights you hit your BRAWN era numbers ? Was this straight away or a within a few months as with the Hammer Strenght ? Wrote my recent training history out poorly Chris. Hammer & free weights for years. Then about a year ago the gym gets rid of most free weights and all Hammer for Life Fitness machines. After a month of training on that garbage I leave. Bought a chin & dip station and some gymnastic rings and have been training BW exclusively for about a year. Hit the Brawn era numbers training in a friends cage. Exercises were push press, decline bench, and rack deadlift, which I gravitated to for safety’s sake towards my final Brawn era training phase. I expected no less. I can’t count the number of times I would be training excellent athlete and after a while he would test his strength throwing barbells and he would believe he hadn’t gotten stronger even though he or she were doing the best they ever done in the chosen sports. Cmon Russ thats an exaggeration- right. Also as i said before, if it does not carry over or at least maintain strenght with a barbell a dead weight then how does it carry over or maintain anything else ? That is so true! Since soaking in all I can reading your stuff and learning to train in the SS way, I was wondering how it would carry over so I started using a split which included some old school barbell stuff done at traditional rep speeds. What I found out very quickly after a break in period was that I was stronger than before on all of the exercises and significantly more so on a few. It definitely did take a few cycles as I was out of practice but man did the weights get lighter quickly after that. I am training an athlete who’s time to near failure and failure is about 40 seconds. He is a excellent college pitcher and he has about 25 teams scouting him his college coach is making the athlete do high volume pole sprints and push ups and it is just slowing the athlete up because he has high neurological efficiency and at 6’3″ about 190 lbs somewhat slender build. What would you suggest to reach this coach? Just the other day I engaged in stiff legged deadlifts and decided to approach it in the “sport of weight lifting” style. I emphasize sport. Instead of starting with a working weight (where I last left off) and slowly lifting to make the most of a warm up, I started in the traditional fashion, lifted light and graduated up to my working weight. I was able to “bang” out 9 reps using explosive movement. Instead, I opt to slow it down and take momentum completely out of the game, finishing last set to failure. Riddle me this, Mike W… Why did that same weight I was “banging out” in a traditional weight lifting style feel so much easier than slowing down? Why did it all of a sudden become exponentially harder when I slowed down and had to focus on muscular recruitment? Why was it at that point, adding 50 to 100 more pounds would’ve been absurd? Why did I feel more fatigue (i.e., inroad) in the targeted muscle group by going slower? I also performed another test doing dips. I could do close to 30 in loose form, 1-2 seconds. I did, however hold on, instead of quiting and saving for another set, as is the custom. I dug deep, and going as hard and fast as I could, I came to a grinding slow speed. Probably close to a 10 second positive, though it’s hard to count when all thought is dedicated to contracting. Both moving fast and without momentum require skill. That being said, for me, moving a heavier weight with momentum, seemed easier and thus less effective in loading the targeted muscle group than moving at a more controlled speed. I could only dream of going up in weight by involving momentum. That would be great engaging in the “sport of weight lifting” where moving the heaviest weight from point A to point B is the name of the game. I had no problem “firing my auxiliary groups”, Mike W. And would most likely get better if I practiced the sport. But I would train slow for strength for sure. Back in the summer of 1991 I was personally trained by Keith Whitley for a 10 week span. I gained 17 pounds that summer through twice weekly workouts and force feeding myself. He advised on not taking nutritional supplements. 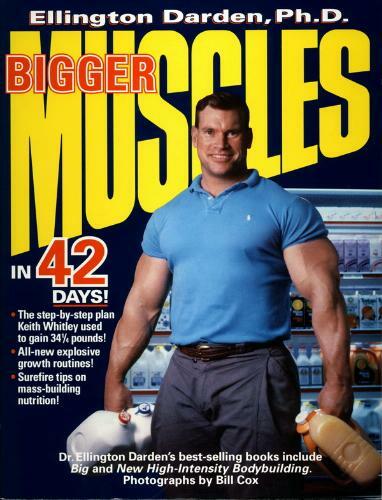 He was enormous, the biggest muscular guy I had ever seen to that point (he was about 6’1″ tall). The 34 pound weight gain was just good eating, amongst other things, after coming off a pre-contest depletion diet. After I saw him, who never made it to the Olympia, I wondered how big Dorian Yates was in person. 246 contest ready was really big back in 1991.